Thinking further. Thinking about what’s next. We’re bringing our innovative wood-based materials to North America. As the global leader in the manufacturing of wood-based materials we are trusted by fabricators, architects and customers worldwide. Now, we’re bringing our culture of innovation and our commitment to excellence stateside with a production site in Lexington, North Carolina. 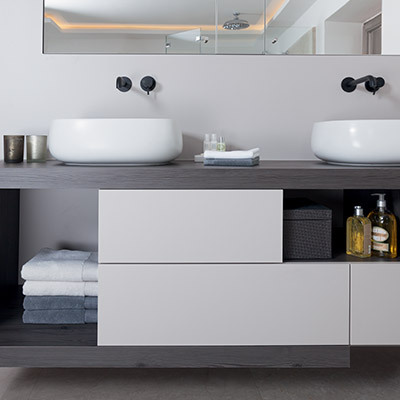 You’ll be able to create your dream space, plan and design with our new inspirational ideas in kitchens, baths, closets and everyday modern spaces. Experience the possibilities of thinking differently by visiting our booth at the 2019 Kitchen & Bath Industry Show (KBIS) at the Las Vegas Convention Center. Our wood-based, thermally fused laminate (TFL) line can help you deliver a great final product — a beautiful choice for high-performance surfaces — while building your business. A commitment to authenticity is evident throughout, with products full of expression, character, depth and realism. Take your pick from hundreds of decors, in a variety of different materials and realize your projects with the perfect color and shade. Try out various color combinations to see how they look in-situ using our online EGGER Design Guide. If you’re based in the U.S. or Canada, you’ll reap tremendous benefits from the opening of our first plant in the U.S. You’ll get design flexibility and faster service, as well as access to matching products from stock — all sourced from us, your single supplier for TFL, laminate, and edging. Meet and hear from Klaus Monhoff, Head of Design and Décor Management for EGGER. As one of the world’s leading authorities on interior trends for the kitchen and bath industry, Monhoff will discuss current and future thinking about design trends at 2 p.m. on Feb. 19 and 20 at our booth SL3207. Discover what EGGER is all about. Schedule an appointment to meet with us at KBIS 2019. We’d love to introduce ourselves and learn more about you! All our shown and mentioned decors are reproductions.